Pauline Authorship and Scholarly Consensus. An interesting chart. As any seminary student knows, not everyone agrees that Paul wrote all the letters that are attributed to him. There are doubts about his authorship of 2 Thessalonians, Ephesians, Colossians and the Pastorals. But to hear some people talk you would think that there is unanimous agreement. But the chart here shows otherwise. It is taken from an article Paul Foster wrote and a poll he took at a session of the British New Testament conference. 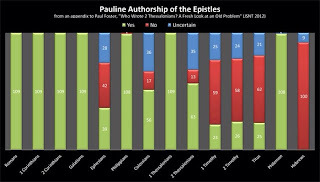 While this can't be called a scientific poll, it is interesting to note that while many suspect Paul didn't write the Pastorals, many do favor Pauline authorship of the other disputed epistles. Like myself, many could go either way on Ephesians. Pieces of the Cross Discovered? holds a stone fragment engraved with a cross. trash (cans, bottles, food scraps, etc). I am talking about the pile of stuff that appears at the curb when someone cleans our their basement or closets either as part of a new year resolution or in preparation for a move. I remember one such "treasure pile" when I was kid. My brother and cousin discovered it around the corner from our house and spent some time "treasure hunting." Among the things they brought home was a small plastic bag containing some splinters with a piece of paper claiming that they were from the cross of some long dead saint. I don't know whatever happened to those splinters and to the best of my knowledge they never caused any miracles to occur in our house. But they are an important reminder that people think that having an artifact from history somehow makes history real and provable for them. Christians have been saving and venerating "holy relics" since the earliest days of the church. John Calvin is said to have once quipped that if all the pieces of the "true cross" scattered across Europe were gathered together they would provide enough wood to build a small ship. Turkish archaeologists say they have found a stone chest in a 1,350-year-old church that appears to contain a relic venerated as a piece of Jesus' cross. The artifacts were unearthed during a dig at Balatlar Church in Turkey's Sinop Province, and displayed this week by excavation team leader Gülgün Köroğlu. “We have found a holy thing in a chest. 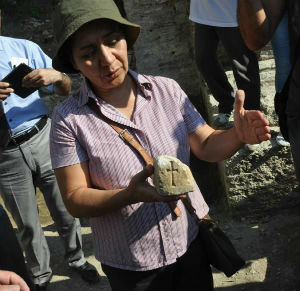 It is a piece of a cross," the Hurriyet Daily News quoted her as saying. Köroğlu, an art historian and archaeologist at Turkey's Mimar Sinan University of Fine Arts, said the team suspects that the chest served as a symbolic coffin for the relics of a holy person — and that the fragments within it were associated with Jesus' crucifixion. Well, that is certainly not much evidence to go on. Perhaps the fragments in the chest are from the "real cross" or it could be that the fragments are splinters taken from the hand of the Roman soldier that crucified Jesus. Or it could simply be some other type of wood object that was in the chest and had decomposed over time. All of this has a familiar ring to it. See the post I did on the supposed discovery of John the Baptist's bones in Bulgaria. The fact is, promoting sensational claims like this to the public is not an example of responsible archaeology. This resembles more the "treasure hunt" I described above than a scientific inquiry. I realize that archaeologists need to raise money for their work and that sometimes donors want to see results. But this type of hype only serves to discredit the hard, serious work of those who take years to carefully uncover and study the past. Nonetheless, there will be those who will hold up this "discovery" as proof that Jesus really was crucified and therefore everything the Bible says must be true. But just like the treasure hunting archaeologist, these people of faith are missing the real point of studying the Bible. Man sues over the death of Jesus claiming his human rights were violated. File this under "you can't make this stuff up." A man has filed a lawsuit with the International Court of Justice at the Hague in an attempt to get Jesus a new trial and overturn his conviction. Here is part of the report from the Jerusalem Post. A Kenyan lawyer has filed a petition with the International Court of Justice in The Hague, suggesting that the trial and crucifixion of Jesus Christ was unlawful, and the State of Israel among others should be held responsible, Kenyan news outlet the Nairobian reported on Friday. Dola Indidis, a lawyer and former spokesman of the Kenyan Judiciary is reportedly attempting to sue Tiberius (emperor of Rome, 42 BCE-37 CE), Pontius Pilate, a selection of Jewish elders, King Herod, the Republic of Italy and the State of Israel. “Evidence today is on record in the Bible, and you cannot discredit the Bible,” Indidis told the Kenyan Citizen News. Although those he suggests should have been convicted during the original trial have not been alive for more than 2,000 years, Indidis insists that the government for whom they acted can and should still be held responsible. Indidis apparently named the states of Italy and Israel in the lawsuit because upon the attainment of independence, the two states incorporated the laws of the Roman Empire, those in force at the time of the crucifixion. I am sure (OK, I am hoping) that there is more to this story. It seems unfathomable that he doesn't have a basic grasp of history to understand that you can't sue empires and governments for an act that happened 2000 years ago. The statue of limitations aside, how does one sue dead people and the government they represented when none of them exist? Furthermore, had Mr. Indidis spoken with any number of New Testament scholars they might have warned him that using the Bible as a basis for evidence in a legal dispute was probably not going to help him build a strong case. Nonetheless, it would be interesting to hear his cross examination of say Pilate or Caiaphas. Lawyer: "Where were you on the evening of Maunday Thursday?" Lawyer: "Are you refusing to answer the question?" Witness: "Answer it? I don't understand it! You do know I have been dead for the last 2000 years, right?" Although I wasn't able to join the team this year, the work at Tel- Gezer continued under the leadership of Steve Ortiz and Sam Wolff. The season is now over, but an update of the work has been posted by Steve Ortiz. JERUSALEM -- The period of the United Monarchy has received much press and attention this summer as current excavation projects in Israel have presented sensational results. While much attention has been paid to King David’s activities, archaeologists have been quietly excavating one of the famed cities of Solomon since 2006. 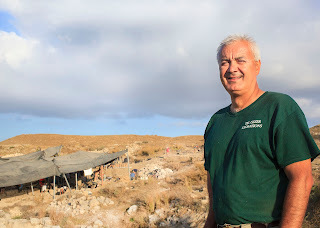 A team of nearly 80 staff and students from several countries (U.S., Israel, Palestinian Authority, Russia, Korea, Hong Kong) spent the summer digging at Tel Gezer, located between Tel Aviv and Jerusalem in a valley that guards the pass that leads up from the coastal road (the "Via Maris") to Jerusalem. Tel Gezer is known from several ancient Egyptian and Assyrian texts as a major city located on the coastal highway between the kingdoms of ancient Egypt and Mesopotamia. It is known from biblical texts as a city conquered by an unnamed Egyptian pharaoh and given to Solomon as a wedding gift between the Israelite king and pharaoh’s daughter. Solomon is credited in the Bible with building the walls of Jerusalem, Hazor, Megiddo and Gezer (1 Kings 9:15-16) -- four major sites that are currently being excavated. The excavations at Gezer are sponsored by the Tandy Institute of Archaeology at Southwestern Baptist Theological Seminary with several consortium schools. The excavations are directed by Steven Ortiz of the Tandy and Samuel Wolff of the Israel Antiquities Authority. In this, the sixth season of excavation, one goal was to remove a portion of the city wall built in the Iron IIA period (10th century BCE) in order to investigate a Late Bronze age destruction level (ca. 1400 BCE) that lay below it. To the surprise of the team, in the process of excavating the city wall, an earlier wall system dating to the Iron Age I (1200-1000 BCE) was discovered. This wall was one meter thick with several rooms attached to it. These rooms were filled by a massive destruction, nearly one meter in height,that included Canaanite storage jars, Philistine pottery and other items. A fragment of a Philistine figurine was also found this season. The biblical text record that the king of Gezer organized a Canaanite coalition against Joshua and David had a battle with the Philistines where he chased them “all the way to Gezer.” Perhaps the biblical accounts retain a memory of the importance of Gezer and its close relations to the Philistines during this period. Beneath this city was an earlier city that was destroyed in a fierce conflagration. This city was functioning during the Egyptian 18th Dynasty’s rule over the southern Levant. Within the destruction debris were several pottery vessels along with a cache of cylinder seals and a large Egyptian scarab with the cartouche of Amenhotep III. This pharaoh was the father of the heretic King Akenaton and grandfather of the famous Tutankhamun (King Tut). This destruction corresponds to other destructions of other cities in the region, a reflection of the internecine warfare that was occurring between the Canaanite cites as reflected in the well-known Tell el-Amarna correspondence. The archaeology of Solomon has been controversial, fueled by various theories over the dating of the archaeological record. The dating of the Gezer Iron Age Gate is at issue. The Gezer expedition is slowly stripping away layers of public and domestic structures of the 8th and 9th centuries BCE in order to reveal the 10th century city plan adjacent to the City Gate. This summer the tops of the 10th century walls began to poke out, making the archaeologists optimistic that in future seasons more of the Solomonic city will be exposed. The results of the Tel Gezer excavations will be presented at the end of the month at the 16th World Congress of Jewish Studies to be held in Jerusalem. The excavation results will be presented along with other projects in the region in a joint session on the history of the Shephelah region (foothills of Judah). The Gezer Excavation Project is one of three field projects of the Tandy Institute for Archaeology. Gezer is the flagship archaeological field school of the Tandy Institute including the support of the following consortium schools: Andrews University (2013), Ashland Theological Seminary, Clear Creek Baptist Bible College, Lycoming College, Lancaster Bible College and Graduate School, Marian Eakins Archaeology Museum at Golden Gate Baptist Theological Seminary, and Midwestern Baptist Theological Seminary. For more information see www.telgezer.com. EDITOR’S NOTE: The following report is by Steven Ortiz and Samuel Wolff, co-directors of the Tel Gezer archaeological excavations in Israel. Ortiz is professor of archaeology and biblical backgrounds and director of Southwestern Baptist Theological Seminary's Charles D. Tandy Institute for Archaeology in Fort Worth, Texas. Wolff is senior archaeologist and archivist at the Israel Antiquities Authority, Jerusalem.